Crowley is a sophisticated charmer in the flesh, but he must have a tough underside to tackle a story like “Boy A,” in which a young boy imprisoned for murdering another child emerges after 14 years with a new name and identity, but without the social skills that youths normally develop. In fact, fear of being exposed overshadows everything. And the UK is infamous for its intolerance of child murderers, no matter what their ages. All of the kids in the film are victims of abuse. Andrew Garfield, who’s done mostly theater and TV, was an inspired choice for the lead, who was given the name Jack Burridge post-incarceration and had been known to the public as ‘Boy A’ during his trial. Crowley and I met in New York in April. The Weinstein Company opens the film in limited release beginning Wednesday, July 23. Indiewire: Boy A started out as a novel by Jonathan Trigell, then became a screenplay by Mark O’Rowe, who had scripted your first feature, Intermission. How did the next step, the actual filming, come about? John Crowley: [The UK’s] Channel 4 knew that I was suddenly available and sent me a bunch of stuff that they had on their slate, one of which was “Boy A.” I pulled my team together very quickly and shot it in five weeks and edited it in six. Mark did an incredible job of “fileting” the novel, leaving out a lot of stuff, including a huge amount about Jack’s time in prison, which would be a whole other film. We wound up concentrating on the childhood section and the lead up to the murder of the girl and the six months of Jack’s life post-incarceration. iW: Where is it set? JC: Mostly Manchester. The childhood is somewhere on the outskirts of London, it’s never stated. The prison would be somewhere outside London as well. And they move him to Manchester. iW: How did you find Andrew Garfield? JC: I had seen him in a play at the National Theatre called Chatroom, so I knew he was an exceptional young actor. We went to do auditions in London and saw loads of young kids, including all the hot young stage and TV actors. Andrew was in LA making “Lions for Lambs” for Robert Redford at the time, so he put himself on tape as Jack. Once we saw it, it was an open and shut case. 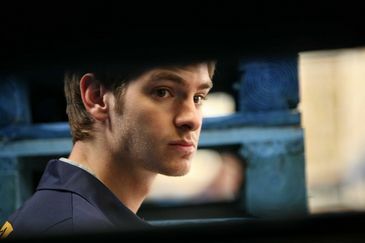 Andrew Garfield in a scene from John Crowley’s “Boy A.” Image courtesy of The Weinstein Company. iW: It’s interesting that the viewer never sees Boy A do anything murderous, yet in the courtroom neither he nor the friend (Boy B) he was with during the killing of the young girl, Angela, will talk or blame the other. JC: It was a conscious choice not to show the murder for a variety of reasons. I felt there was an ethical distance that I wanted to draw a line under. Yet at the same time, the last shot of the murder sequence is Boy A picking up a knife, looking at it, and a deciding to walk under the bridge where Angela is killed. The boys were utterly marginalized, certainly boy B, who had been brutalized as a child. There’s a bond between the two boys that is incredibly strong and tragic. There is no pulling them apart. It is intended in the film, however, that Boy A be involved in the murder. iW: You successfully show working-class violence that many others in the UK have depicted over the years, like Ken Loach and Mike Leigh, or in the recent film “The Great Ecstasy of Robert Carmichael,” in a way that is aesthetically pleasing. Some films of this type are too self-conscious. Yours is beautiful without being too beautiful for such subject matter. JC: I’m very glad that you picked up on that, because sometimes people have said, “Oh, this is Ken Loach. I love Ken’s work, but we did make a conscious choice NOT to treat the subject in a way that it is usually handled, especially for British television, that gritty, realist, shaky, handheld, quasi-documentary feeling. I didn’t want that. Because there was something in the middle of the script, apart from the brutality of child abuse that was surprising and made me want to make the film, that was lyrical, how lyrical Jack’s story was in the present, and how many good things happened to him, even though he wound up losing them. I wanted the film to be a bit more observational, and I wanted the world for him to have a degree of “framing” rather than just following and shaking all the time. I didn’t want the kid’s parents to be fully visible, I wanted it to be like something Bresson did in l’Argent, which was to break up the human body. JC: Yeah, exactly. It’s as if to suggest what some kids undergo when their parents brutalize them by treating the parents in the same way they treat their kids, dehumanizing them. You see the parents’ hands cut off visually, for example, you see a head in the bedroom. You never show them as a whole body but you treat the two kids as whole creatures. The other thing was that I had this idea of the spirit of Angela always following Jack in the present. That led to occasionally shooting with Steadicam, just following him, like a gentle glide, which was quite elegant but which could be quite ominous at times. You have to be subtle with it, but these things add up and have an emotional impact on the audience. I was quite influenced by Festen (Celebration). It has always felt to me that the spirit of the sister is always around, and that is the point of view, the omniscient eye. My D.P., Rob Hardy, and I discussed various films, like Gus van Sant‘s “Elephant,” which led us back to a film with the same title by the late British director Alan Clarke. And there was also a shot in “Brokeback Mountain,” of all films, the one in which Heath Ledger finds out that Jake Gyllenhaal is no longer alive. He has sent a postcard and it’s returned to him. Someone would expect the shot would move to his face at that point, but instead Ang Lee‘s camera tracks behind his head and then stops–on the BACK of his head. And the story is all about hiddenness, like when you can’t speak, and privacy. In a way that was a Eureka moment. That’s why we went after a certain way of almost dwelling on the back of Jack’s head. There’s this degree of privacy and a WISH to know what’s going on inside. At the heart of it is a boy’s wish to show the world who he is, not to tell them what he did, but who he has actually now turned into, and the terror that if he does, the world will destroy him.